AP EAMCET 2019 Notification: Andhra Pradesh EAMCET 2019 Notification, Exam Dates, online application form are available at sche.ap.gov.in. Candidates can check AP EAMCET 2019 Important Dates For Paying Fees, Weightage, Courses Offering, Eligibility Criteria at official website. 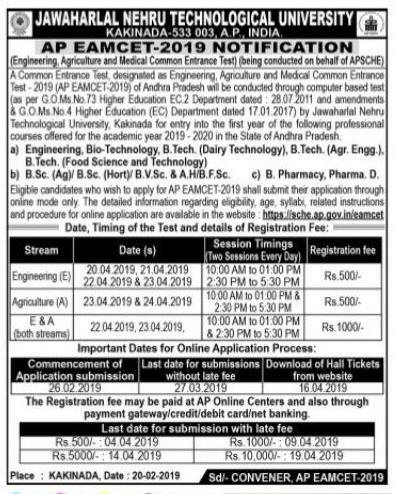 Download the AP EAMCET 2019 Official Notification PDF below. A Common Entrance Test, designated as Engineering, Agriculture and Medical Common Entrance Test – 2019 (AP EAMCET-2019) of Andhra Pradesh will be conducted through computer based test by Jawaharlal Nehru Technological University Kakinada. Kakinada for entry into the first year of the following professional courses offered for the academic year 2019- 2020 in the State of Andhra Pradesh. AP EAMCET 2019 Application Form Online Released. Students Can Payment Fee Amount and Registration from Below Mentioned Link From February 26th. ఏపీ ఎంసెట్‌-2019 నోటిఫికేషన్‌ను కన్వీనర్‌ ప్రొఫెసర్‌ సీహెచ్‌ఎస్‌.సాయిబాబు విడుదల చేశారు. 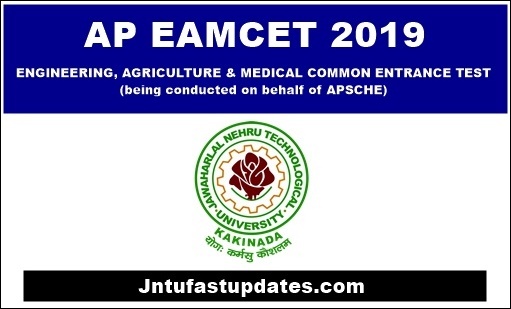 Engineering, Agriculture and Medical Common Entrance Test (EAMCET) is conducted by Jawaharlal Nehru Technological University Kakinada on behalf of APSCHE. This examination is the prerequisite for admission into various professional courses offered in University/ Private Colleges in the state of Andhra Pradesh. The Entrance test is of 3 hour duration and the question paper consists of total 160 questions comprising of 80 questions in Mathematics, 40 questions in Physics and 40 questions in Chemistry. c) B. Pharmacy, Pharma. D.
Eligible candidates who wish to apply for AP EAMCET-2019 shall submit their application through online mode only. The detailed information regarding eligibility, age, syllabi, instructions and procedure for online application are available in the website www.sche.ap.gov.in. Andhra Pradesh EAMCET (Engineering Agricultural Medical Common Entrance Test) 2019 is a Entrance Test to get Admission in Engineering and Medical Colleges through out Andhra Pradesh State. After Bifurcation of AP & Telangana, 2 states CM’s had planned to conduct TS EAMCET 2019 & AP EAMCET 2019 Separately and Andhra pradesh & Telangana Eamcet Results in same month without clashes. So, get ready to prepare the AP EAMCET Previous Question Papers Sets to get Good marks in EAMCET Exam 2019. Andhra Pradesh EAMCET 2019 is Written Test to write in Allotted Centers across Andhra Pradesh. AP Government has released the AP EAMCET official Notification in the month of February 2019. They Are Planning to Conduct AP EAMCET Exam from April 20th to April 24th, 2019 as per Primary Sources. Check all the Important details like hall tickets download, Last date Fee and Results below Notification. Criteria for Ranking: As per G.O.Ms.No 73 of Higher Education(EC.2) Department, dated 28-07-2011, the candidates who have secured qualifying marks in AP EAMCET-2019 and candidates belonging to the category of Scheduled Caste and Schedule Tribe, for whom qualifying marks have not been prescribed, shall be assigned ranking in the order of merit on the basis of combined score obtained by giving 75% weightage to the marks secured in AP EAMCET-2019 and 25% weightage to the marks secured in the relevant group subjects namely Mathematics, Physics, Chemistry of the qualifying examination. How to submit Application Form: AP EAMCET 2019 application should be submitted through ONLINE mode only. The Candidates who wish to apply for AP EAMCET-2019 are requested to fill the particulars carefully in the ONLINE APPLICATION FORM. The required information should be collected from the relevant documents. AP EAMCET 2019 Online Application will Be Available in Online Mode, So you should Pay through online with the help of AP Online / TS Online / e-Seva / Mee Seva, Credit or Debit card details. After submission of ONLINE APPLICATION FORM, if any corrections are to be incorporated, candidate has to contact the office of CONVENER, AP EAMCET-2019 or any nearest REGIONAL CENTRE with the documentary proof. Data will be changed only if documentary evidence is satisfactory. HENCE, CANDIDATES ARE REQUESTED TO FILL THE ONLINE APPLICATION FORM CAREFULLY. AP Eamcet 2019 is Organizing by Jawaharlal Nehru Technological university, Kakinada (JNTUK) for entry into the first year of the following Under Graduate Professional courses offered for the academic year 2019-2020 in the University & Private unaided and affiliated Professional colleges in the State of Andhra Pradesh. (i) Candidates should have passed or appeared for the final year of Intermediate Examination (10+2 pattern) with Mathematics, Physics along with Chemistry / Biotechnology / Biology as optionals or related vocational courses in the fields of Engineering and Technology, conducted by the Board of Intermediate Education, Telangana / Andhra Pradesh along with bridge course or courses conducted by it for candidates enrolled during 2000-2002 and subsequent batches, or any other examination recognized as equivalent thereto by the Board of Intermediate Education, Telangana / Andhra Pradesh, provided that candidates who have passed or appeared for the final year of Intermediate Examination (10+2 pattern) with Biology, Physics and Chemistry as optionals along with the bridge course examination in Mathematics conducted by the Board of Intermediate Education, Telangana / Andhra Pradesh shall also be eligible for the BioTechnology course. Andhra Pradesh EAMCET 2019 Results and Rank Card Will be Available After Completion of Exam. Score and EAMCET Rank is important to get the seat in EAMCET Counselling 2019. So, Stay Tuned here for the AP EAMCET 2019 results, rank card. If you have any Doubts, feel free to leave your comment below. If you Like this Article, Please share in Facebook, Twitter, Whatsapp with your Friends to get Awareness. My name is Valisetty Ramaneesh Completed Intermediate 2nd Year & I have Applied for EAMCET. While Filling Application I have done a mistake. Instead of giving intermediate 2nd Hallticket Number I have given SSC Hallticket Number. So please Accept My Mistake And Change My Qualifying Hallticket Number. Here I am Submitting My Application Details. Please Check. These are the details sir. Please Change my hall ticket number. nagaraju,thanks so much for the post.Much thanks again. Really Cool. Is there any possibility to continue my b.tech 2nd year in another clg ..
i am completing inter vocational with bridge course bipc 75%. so we are also eligible or not. can i apply for 2018. My son studied upto 8th class at andhra pradesh. due to transfer of mine shifted to uttarakhand and appearing for 12th class throuch CBSE board. i would like to send for emcet 2017. is he eligible for emcet. we belongs to andhra pradesh any how after retirement will settle at andhra pradesh only.